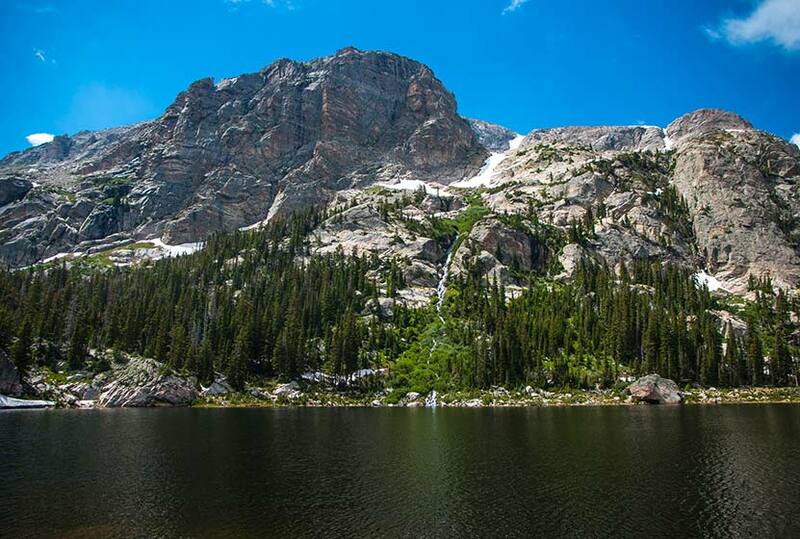 Pear Lake is a great destination for solitude, fishing, and mountain views. 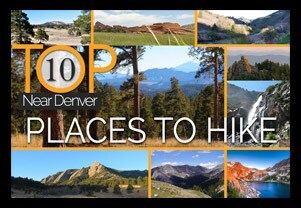 It’s a 6.5 mile, demanding hike through some of the best wildflower country in Rocky Mountain National Park. After passing Finch Lake, the trail makes its way to the higher, Pear Lake where Copeland Mountain appears to shoot straight from its shores into the sky. 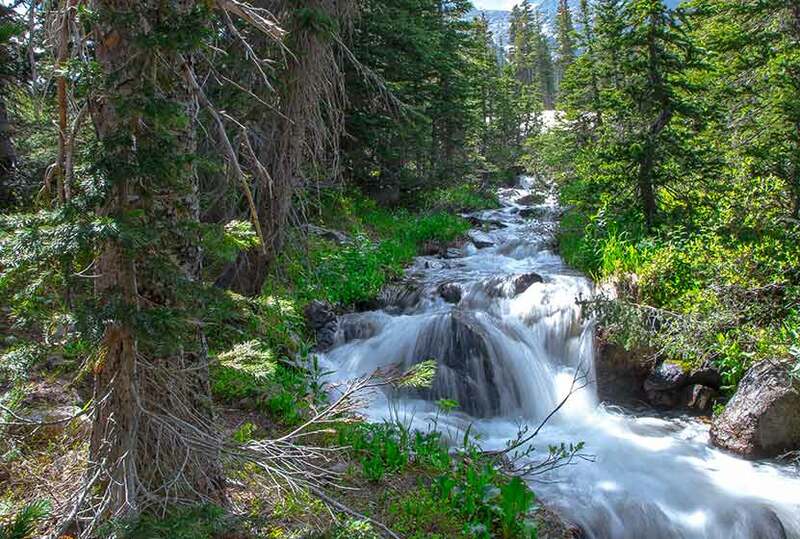 Explore the full Pear Lake hike profile below for trail map, driving directions, and more tips and details to help you enjoy this adventure in Rocky Mountain National Park. 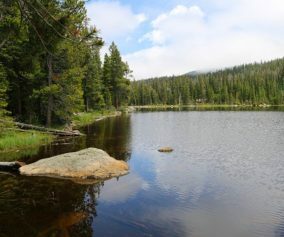 The hike to Pear Lake begins at the the Finch Lake Trailhead, located approximately 1/5th of a mile east of the larger Wild Basin Trailhead near Allenspark, Colorado. Because there is very limited parking at the Finch Lake Trailhead, most hikers will need to park at the Wild Basin Trailhead and add the 1000′ feet of trail between the Wild Basin Trailhead and the Finch Lake Trailhead to their journey. There is an alternative approach via the Allenspark Trailhead. However, the route described in this trail profile will be from the Finch Lake Trailhead nearest to the Wild Basin Trailhead. 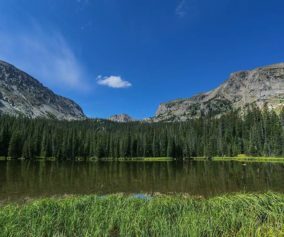 The hike up to Pear Lake is a steady climb through a forest of pine, aspen, spruce, and meadows laden with wildflowers. It’s a demanding hike from the outset, coursing up a set of switchbacks to gain the ridge of a lateral moraine. After this initial east bearing segment, the trail turns back to the west begins a gentle descent through one of Rocky Mountain National Park’s most stunning displays of wildflowers. Near the bottom of the moraine, near Fox Creek, the trail encounters its first junction. The the trail to the right/west leads towards both Finch and Pear lakes (the left/east trail leads to the Allenspark Trailhead). 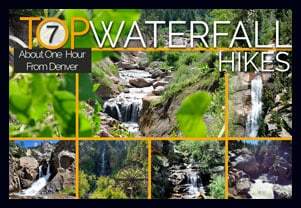 Climbing higher, the trail will pass an overlook with views of the distant mountain peaks of Pagoda, Meeker, and Chief’s Head, as well as views of the greater Wild Basin area. After approximately 1/4 mile, the trail passes through a burn area from the 1978 fire, which has made a good recovery and is now riddled with summer wildflowers. 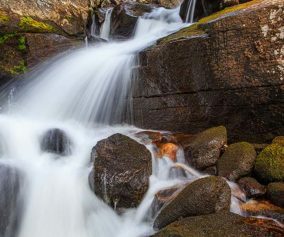 Continuing to work uphill, the trail makes several stream crossings before a descent to Finch lake, which begins at 3.8 miles. Then, at approximately 4.25 miles, the trail makes a hard right-turn. This part of the trail is often obscured by snow as late as as midsummer and early as the first signs of autumn. At Finch Lake the trail wraps around the eastern edge, then the northern shore of the lake. The next segment of trail, from Finch Lake to Pear Lake is approximately 2 miles. These are steep and demanding. Winter snows last into the early months of summer. July brings an incredible display of wildflowers in both the forest and meadows, and the abundance of moisture and vegetation makes this broad valley a great place for viewing wildlife. At approximately 6 miles, the trail will cross pear creek. The forest then gives way to rock and eventually to Pear Lake. Pear Lake is enclosed by a ring of rock and mountain. The rugged rock and cliffs of Copeland Mountain come down to meet the northwestern shores. In the early hours of morning, the images Copeland Mountain and Ouzel peak can be seen mirrored in the lake. Pear Lake is a great place to fish and is catch and release only. A fishing license is required and State and Park fishing regulations apply. There are two campsites near Pear Lake: Pear Creek (just below the lake), and Pear Lake Campsite. These backcountry camping sites can be reserved through the RMNP Backcountry Offices. Because this is such an extensive hike (13 miles roundtrip), camping may be a good option if you want to fish or explore the surrounding area. 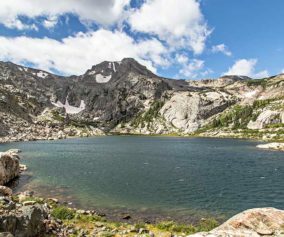 Further exploration can be made of the Cony Creek drainage where a series of paternoster lakes lead up to the highest lake, Cony Lake. This area does not have maintained trails and requires hikers to have well-developed backcountry land navigation skills. Fuel Your Body: It’s a long and very demanding hike, so be sure to bring plenty of water and food for the trip. 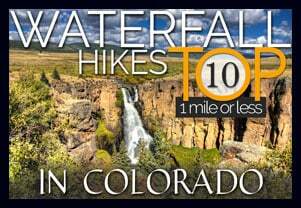 Trekking Poles: For most hikes in RMNP, especially if you are traveling on unmaintained trails, we recommend using Trekking Poles. They take a lot of weight off the knees and help in navigating uneven terrain. Photo: We would like to express our gratitude to Shea Oliver for sharing such amazing photographs of this hike to Pear Lake in RMNP.